Presenting the least-threatening werewolf of all time. Ain’t he the cutest? Especially his little slippers. Can’t blame Steve Ditko. We all draw silly stuff like that when we work with Jack Daniels. I was adoring those precious slippers of his and then saw your comment. For every Spider-Man (or Dr. 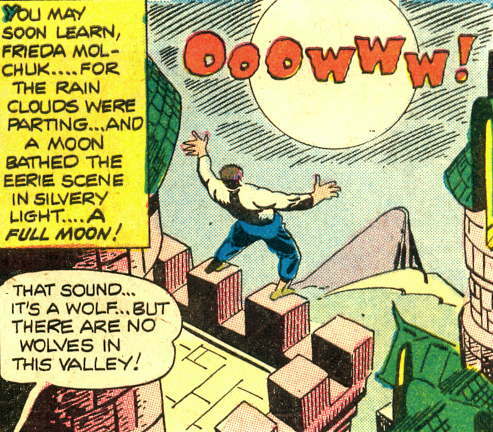 Strange, etc…), there had to be a “very special” werewolf. Did he step on a nail in that first panel? Why he’s simply adorable. Don’t you just want to scratch him behind the ears? I loved Charlton Comics. Never very good, but hypnotically entertaining nonetheless.